Imagine a company whose purpose is to help you achieve financial well-being. Wouldn't they put your needs first? Wouldn't they try to save you money wherever they could? Wouldn't they make it easy for you to get what you need? Wouldn't they serve you with respect? You don't have to imagine. We're Digital Federal Credit Union. Most members simply call us DCU. Over 500,000 DCU members have made us one of the fastest growing credit unions in America. People often choose us for the value and convenience they see in our products and services. They stay and refer their friends and family for a deeper reason. They feel how much the people of DCU care about them and are determined to help them make the right financial decisions. 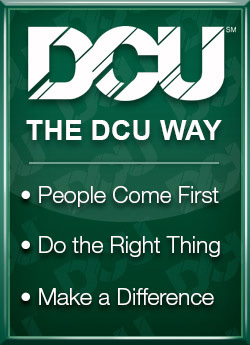 It's Banking – The DCU Way. What is The DCU Way? Serving you is our only priority – We are a credit union. A credit union is a not-for-profit financial cooperative. That means we are owned by and operated for you and your fellow members. Our people care about you – To serve you the way you deserve, we've built a dedicated team of friendly people eager and ready to go the extra mile for you. Consumer education – Our award-winning, unbiased StreetWise Consumer Education Program is strong evidence of our commitment to member consumer and financial education. We listen to you and respond – If you have a question, problem, or concern, you can expect us to take it seriously and address it fast.